OPENING CHICAGO’S NINE MILES OF PNEUMATIC MAIL TUBES. From today, the statisticians will augment Chicago’s list of the “largest things in the world” by the addition of its “nine miles long” system of pneumatic postal tubes, which formally was opened yesterday at the temporary postoffice in the presence of 500 federal, state, county, and city officials, railroad and business men. The first “mail” dispatched through the twelve inch brass tubes was a silk American flag. It was followed by a bouquet of roses addressed to Postmeaster General Payne. It took the mail less than three minutes to travel from the Twenty-second Street postal station to the temporary postoffice on the lake front. The first letter was addressed to President Roosevelt, and was signed by Postmaster General Payne, Postmaster Coyne, and Senators Cullom and Hopkins, who were present. 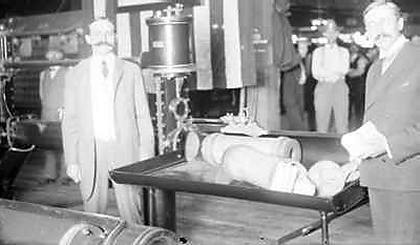 On the right Postmaster Frederick E. Coyne places the first bundle of mail into a pneumatic carrier; note its large diameter compared with European versions. On the left is R. W. Morrell, a pneumatic tube expert. The Chicago postal pneumatic tube ran between the post office and the Winslow rail station. The tubes were rented from the Chicago Pneumatic Tube Company. The tubes just opened are 8.9 miles long and connect the new postoffice, temporary postoffice, Chicago and Northwestern Depot, La Salle Street Depot, Union Depot, Illinois Central Depot, Twenty-second Postal Station, Armour Postal Station, and Stockyards Postal Station. The Twenty-second Street and Armour stations were the first opened for the service. The system is operated by compressed air, the mail being transported in large oblong leather boxes, metal mounted. The system was constructed by the Chicago Postal Pneumatic Tube Service Company, which will receive $119,625 annually for the service. The tubes greatly will facilitate the handling of mail in Chicago. Where hours have been required for the transportation of mail to and from the various stations has been dispatched through the tubes, the first letter taken out of the same bag will have been assorted and started on its destination. Delays created by the accumulation of mail as well as by its slow transportation will be done away with. Armour Postal Station, 3017 Indiana Av. The tube service is now working satisfactorily and is a feature of the service that has resulted in a betterment of the mail facilities. Fifteen minutes’ time is gained in the dispatches to outgoing trains at the Union depot, Northwestern Depot, Illinois Central Depot, and La Salle Street depot, after the usual time for closing mails sent by the screen-wagon service, and a corresponding gain on incoming mails from the same depots. About 80 per cent of the mails for the city of Chicago is received and dispatched by the trains using these depots. 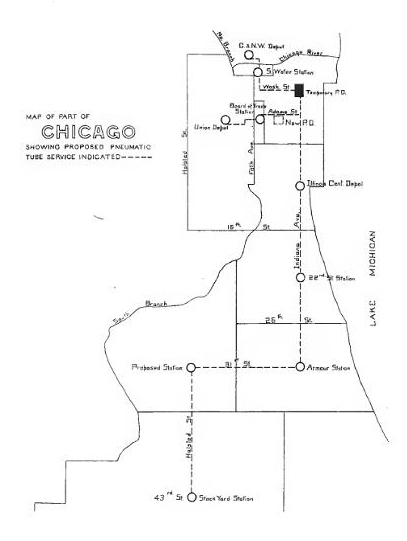 The pneumatic-tube system at Chicago consists of three lines from the new Government building: To temporary post-office and Kinzie Street Station (Chicago and Northwestern depot), 1.83 miles; to La Salle Street depot and Station U (Union depot), 1 mile; to Illinois Central depot, Twenty-second Street Station, Armour Station and Stock Yards Station, 6.05 miles; a total of 8.88 miles, and has been in operation from September 12 and 19, 1904, between the temporary post-office, La Salle Street depot, and Illinois Central depot; from October 3, 1904, between Illinois Central depot, Twenty-second Street Station, and Armour Station; from November 28, 1904, between Armour Station and Stock Yards Station; from December 12, 1904, between La Salle Street depot and Station U; and from March 16, 1905, between the temporary post-office and Kinzie Street Station. Since these lines have been in operation, and up to July 27, 1905, the reports show that 717,510,806 pieces of mail have been carried by tube, a daily average of 2,642,701 pieces, the transit time of which was expedited on an average of fifteen minutes, and advanced delivery and dispatch thereby secured. A system of under ground tubes entirely within the control of the postal service, used exclusively in the transportation of mails, free from depredation en route and the interruption of congested street traffic in the part of the city where the main post-office must of necessity be located, is worth more than can be properly shown in any calculation of minutes and money. The pneumatic-tube system at Chicago is not fully perfected. Its first few months of operation have indicated defects and that improvements were required. These improvements have been given such attention by the contracting company and its officials that at the present time there are but few interruptions to the service from accidents or other causes. The character of the construction has l)een greatly changed. It is now the practice to lay the bends in bricked chambers, called “manholes,” so that ready access to them is provided, and manholes have been put in at intervals of about. 350 feet. Now when from any cause a carrier becomes lodged in the tube, it can be gotten at from a manhole not to exceed 175 feet distant, and with jointed rods force can be exerted to dislodge it or draw it back to the open space, whence it can betaken out of the tube. Thus instead of searching blindly for a “stuck” carrier, perhaps in a section of pipe a thousand feet long, with the consequent delay, the new construction allows an early recovery of the stuck carrier and the opening of the line for regular business without unnecessary delay. Bends of a better character are being used and an improved type of terminal receiving machinery has been invented and adopted. The occupancy of the new post-office, about October 15, 1905. will remove a serious handicap from the tube service, as there will then be three lines of tube available to send the 2,642,000 pieces of mail daily, while at the temporary post-office the great bulk of the mail must be sent over two lines and unequally distributed between the two, as the northwestern line carries but 20 per cent of the tube mail and the line via the new post-office carries the other 80 per cent. 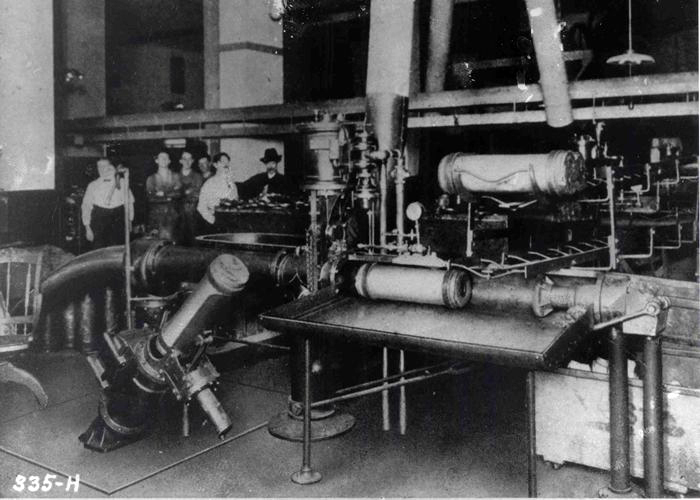 Pneumatic tube terminals at the Main Chicago Post Office about 1910. This is the most expensive method of mail transportation in use at the present time, and the Inspectors very much doubt whether the advantages obtained are commensurate with the heavy expense. As stated earlier the whole Pneumatic Tube System was leased to the Post Office Department, and the contract was renewed periodically. Due to this method, the Congress had to authorize the appropriation. Congress reviewed annual reports in order to determine if the service should be continued. The Postal Appropriations Bill of June 30, 1899, prohibited any new contracts for Pneumatic Tube Service. This prohibition continued until June 30, 1901. Therefore, suspension of service occurred in all cities in from July 1, 1901, through June 30, 1902. No contract could be for more than 4% of the gross postal revenue. After June 30, 1904, renewals had to be provided for in the annual appropriations bill. By imposing these restrictions Congress placed a ceiling on the cost. 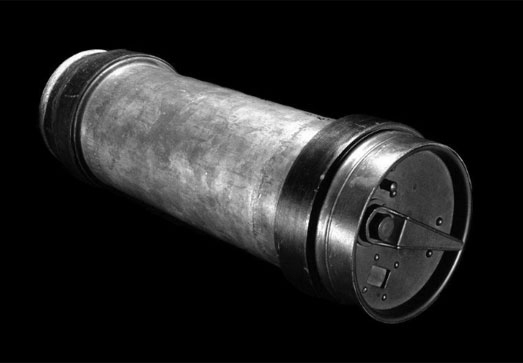 A typical pneumatic mailing tube canister. Empty, the cylinders weighed 18 pounds. Each could hold a pounds of mail, or about 346 letters. The Cylinders went 25 to 30 m. p. h.
In 1906 the pneumatic tube contract expired. The government was unable to secure bids in several cities. Their recommendation was for the service to be discontinued in: Chicago, Philadelphia, Boston and St. Louis; however, it should be continued in New York City. At the insistence of the Pneumatic Tube companies and because of the political strings that may have been pulled, the contracts were extended by the Postmaster General until June 30, 1916, and later extended by Congress until March 3, 1917. The final extension ended June 30, 1918. 1. High rate of speed between stations for limited quantities of mail. 2. Freedom from surface congestion. 1. Only five pounds of mail could by carried in each container; and all classes of mail could not be carried. 2. The minimum time between dispatches is 15 seconds allowing only 20 pounds of letter mail each minute. Therefore, vehicle service would be required to carry mail during heavy volume times. 3. The inability to carry special delivery parcels due to the size of the carriers. 4. The relays at station are built in delays but they are unavoidable requiring all stations to be manned and open during operation. 6. Inability to dispatch to railroad companies without additional handling. 7. Complaints resulting from careless locking and accidental opening of container in transit causing damaged mail. 8. 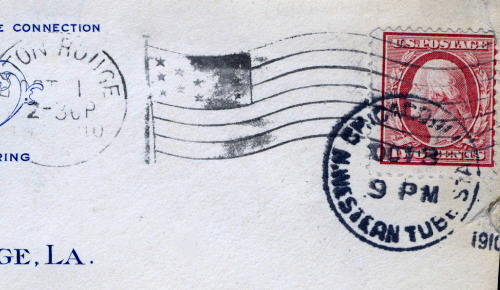 Dampness and oil damage to mail. 9. Service interruptions block an entire line. 10. Congestion from heavy mail volumes. 11. Equipment takes up rented building space. 13. Competition from new motor trucks, which are replacing the horse and wagon mail rigs. In the end, it was President Woodrow Wilson who killed Chicago’s pneumatic tubes. Because the tubes served the U.S. Post Office, they needed federal funding, and not everyone in Washington thought it was a good use of money. In 1918, Wilson vetoed funding for postal tubes in Chicago and other cities. He said the tubes were out of date, and that it was less expensive to transport mail by truck. Chicago still used the tubes as late as the mid 1930’s. A sample of a cancelled stamp that went through the Chicago Pneumatic Tubes at the Chicago & Northwestern Depot in 1910. Several different Chicago tube markings are known. One is a hand-stamp mark in three lines reading “N. Western Tube Sta.-Transit.” Others, such as “La Salle St. Tube Sta.,” ran as the bottom line in regular machine-applied circular cancellations. For mail-messenger service * * * and for the performance of this service in the city of Chicago by underground electric cars, $100,000: Provided, That no part of this appropriation shall be used unless the Postmaster General shall so decide, after satisfactory preliminary trial, and the service can be per formed at a co3t not exceeding that of an efficient wagon sarvice between the same points: Provided further, That any money saved in utilizing this method of transportation, by discontinuance of screen wagon service, on the basis of last year’s expenditures, may be available, in addition to said $100,000, for the purpose of covering the coat of the aforesaid underground electric service. For inland transportation of mail by electric and cable cars * * * provided * « * that the sum of $172,600 of the sum in this item appropriated is hereby made available for the purpose of covering the cost of mail service by underground electric cars in the city of Chicago, 111., during the fiscal year 1906. And the Postmaster General is authorized to contract for said underground service in Chicago at an annual rate not exceeding said sum of $172,600 for a period not exceeding four years. After the passage of the first act numerous conferences were held between the officers of the Department and the Illinois Tunnel Co., which finally resulted in the execution of a contract with that company dated February 13, 1905, whereby that company undertook to carry the mail between the general post office (temporary site), the general post office (new site), Station U, Dearborn Station, Grand Central Depot, Union Depot, Chicago & North Western Depot, La Salle Street Station, and Illinois Central Depot, and between any of them, using therefor cars and electric motors constructed in accordance with plans approved by the Post Office Department, to be operated in the tunnels and over the tracks of the tunnel system in sufficient number and capacity to transport the whole of the mail, whatever might be its size, weight, or increase during the term of the contract, and upon schedules prescribed by the department requiring a speed of not less than 8 miles an hour, the electric motors to be of sufficient capacity to draw 10 tons and to maintain that rate of speed; to operate at the contractor’s expense the motors and cars, furnish all necessary labor and help; to transport thereon when desired an employee of the department in company with the mail; to construct, maintain, and operate at the contractor’s expense all necessary chutes, elevators, and mechanical lifts or belts of such kind and capacity as to meet the requirements of the department for the lowering and raising of the mails between the usual places of exchange in the general Post office, the postal stations, and the railway stations, and the level of the tunnels, the contract term was specified to begin sixty days from the execution of the contract and the approval of plans, and to end June 30, 1908; the compensation to be at the rate of $172,600 per annum, to begin after a satisfactory preliminary trial of the service.